However, there were no verifiable reports of homeowners (or Macaulay Culkin) setting off tripwires or paint buckets to fend off criminals! Brinkmann’s Hardware key duplication service is useful, since having a spare key prevents you from getting locked out, and key copies are available to all family members. First, consider the type of locks you have and whether they offer adequate protection. Deadbolts: Although not as sophisticated as some modern products, conventional deadbolt locks work by bolting the door to the frame. 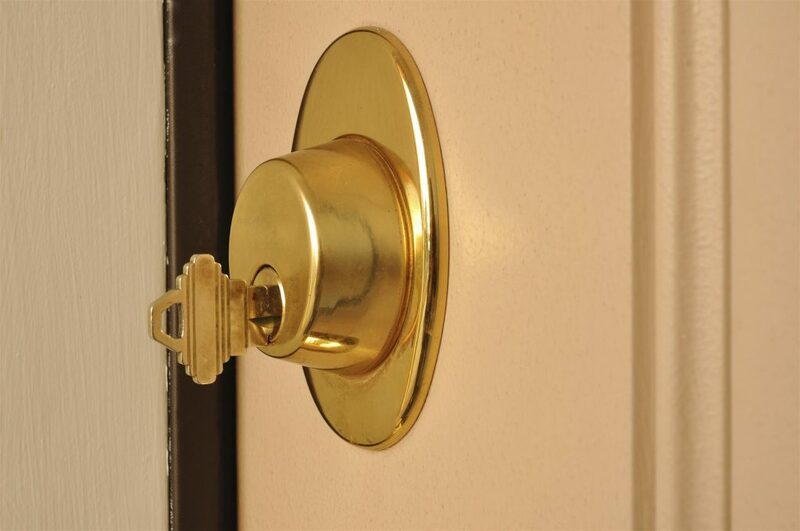 When you move a key or knob, the bolt or throw is manually shifted in or out of the door jamb. This offers more security than spring latch locks, which simply lock the doorknob, so the latch cannot be released; with these, intruders can fit other devices into keyholes or just break the doorknob and lock. Double Cylinder Deadbolt Locks: These must be unlocked on both sides and do not have a thumb-turn mechanism to unlock. If you have a glass door, someone could not break through and turn the other side of the lock to gain entry. In addition to key copy services, Brinkmann’s Hardware can supply such locks—but check with fire and building safety codes to ensure they’re permitted. Keyless Entry Locks: These eliminate the need for key cutting, and remembering a passcode may be easier for some than worrying about losing a key. Plus, it’s unlikely any intruder is going to guess the right code! Many new types combine numerical code entry with a key locking mechanism, while some ultramodern ones include fingerprint identification. Smart Locks: If you’re fine with spending more, advanced models can be controlled remotely. Some even offer voice control and include access logs. A smart lock works via Wi-Fi, so you’ll need equipment to transmit signals. While high-tech, these don’t offer more protection than non-digital locks. However, using a key is as secure as it has ever been. You may be searching “key copy near me,” but some other secure options include durable reversible entry levers, combination locksets, or entry, passage, or privacy locksets. Also, consider some of Brinkmann’s Hardware door guards, slide bolts, and chain fasteners to add an extra level of security, but make sure the door is strong enough to withstand excessive forces, especially if it has a hollow core. Search our online selection of keyed and keyless entry door lock products; to check for “key duplication near me” via local participating stores, “Find a Store” on our website or submit your comments or questions today.